How you handle your kitten or cat can make a huge difference in how she feels about interacting with you, and it's also essential for safety. Learn how to support a cat of any age so she feels secure and comfortable and can better enjoy your petting sessions and snuggles. There are several ways to handle your cat or kitten. You may want to try them to see which one works the best for you. Begin with placing one hand under the cat's stomach and the other hand under her rear as you lift her. Gather her close to your body with the hand that's supporting her belly, and hold her steady against you as you support her rump with your other hand. Gently cross her front legs, and rub her chin as you move her face away from you. When lifting cats out of a cage or from a waist-high surface, if the cat's body is perpendicular to you, simply reach around and along her body with one arm, with your elbow near her tail and your hand up around the front of her chest. Bring her toward you slowly, then lift her gently against your body and delicately cross her front legs. Then comfort her with a chin scratch or an ear rub with your free hand. 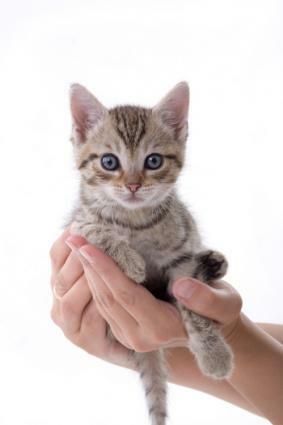 The best way to pick up your cat or kitten is to support their hind legs securely with one hand and hold the upper part of your cat's torso with your other hand. If you have a frightened cat, then get a thick towel or blanket and wrap the cat from the neck down, making sure to put her paws in the blanket or towel. This will prevent the cat from scratching you, plus you have them in a bundle to get to a safe place like their travel box. If you are lucky enough to get your cat as a kitten, start handling them on a daily basis, several times a day, so they become used to you and used to cuddling, and most of all feeling safe and secure. If you adopt a cat at a later age, start slowly with handling them, be patient and know in time you two will become friends and a family. An animal always knows when it has been rescued. Give her some time and all will come together.